Lance Lenoir is not going to return punts for the Dallas Cowboys. The second-year undrafted free agent is trying to do what he can to make the football team, but fielding punts is not one of those things. Lenoir’s struggles holding on to punts haunted him last preseason and they’ve resurfaced again on Sunday night. Twice the Cowboys would muff the punt (albeit, once wasn’t Lenoir’s fault) as they watched as the Arizona Cardinals pounce on the ball. The second time resulted in a Cardinals touchdown. These are terrible things to happen in a football game. When possessions are precious, giving the ball away can hurt and it adds insult to injury when the outcome is points for the other team. I think it’s clear to say that Lenoir’s days returning punts are coming to end soon. The good news for the team’s young receiver is that he was never in the mix as a punt returner anyways. When the games really count, Tavon Austin and/or Cole Beasley will be handling those responsibilities. Lenoir is just a preseason placeholder and he would’ve had to be spectacular to throw his name in the hat for that role on the team. He was far from spectacular. Despite a terrible showing as a punt returner, Lenoir’s chances of making the team shouldn’t be impacted by those plays. Our own R.J. Ochoa already touched on this subject and those crossing Lenoir off their list because of the punt returning gaffes might be overreacting. While looking past the miscues on special teams is something we can get behind, Lenoir chances of making the team is still in jeopardy. He’s had a fantastic camp and he’s went from someone not many people were thinking about to a player many of us had started penciling in to make the final roster. 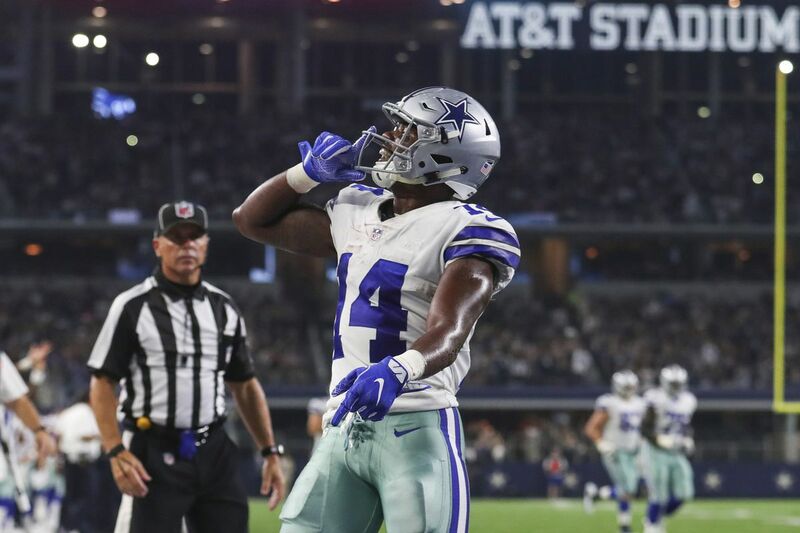 For the last couple weeks, we’ve been discussing whether or not the Cowboys should carry a sixth wide receiver, and if so, who should it be – Lenoir or Deonte Thompson? Some have even suggested that the team could go even deeper and keep a total of seven receivers. Cowboys VP Stephen Jones on with @BenandSkin: “Traditionally we’ve kept 5 or 6 receivers. But if I’m a betting man, I think that ends up being more than 5 or 6” on the 53-man roster to start this season. The Cowboys play about 60 offensive snaps every game, which is 50% more than the 39 snaps we looked at in detail above. If we simply extrapolate from those snaps, the fifth wide receiver might get six snaps per game. But the Cowboys are thinking about keeping seven guys? What are those extra guys going to do all game? Don’t you think the Cowboys offense would be just fine with Allen Hurns, Cole Beasley, Michael Gallup, Terrance Williams, and Tavon Austin? What is a player like Lenoir actually going to add to this team? When is he going to even see the ball. In fact, since the team needs to select seven inactives each game, there would be a good chance that extra wide receiver wouldn’t even dress. That means the Cowboys would be allocating a roster spot just as insurance for the position should someone get hurt. Can the team really afford to do that with so many needs at other positions? And we should ask ourselves this – is Lenoir that special of a talent where having to comb the waiver wire (should a WR get hurt) is that much more of a downgrade that having Lance in their back pocket? I don’t think he is. In fact, we might be overselling him a bit. Lenoir is practice squad eligible and it’s not inconceivable to think they could cut him, wait for him to clear waivers, and then slide him right back on the practice squad as insurance. Some might think he’d be claimed, but the Cowboys are just one team of many that have some young WR candidates who won’t make their squad. And who knows, his sloppy punt-dropping episode on national television might help improve his chances of not being claimed. In 2017, they kept extra corners because they had just remodeled this group after letting Brandon Carr and Morris Claiborne walk in free agency. In 2016, they kept extra linebackers after they learned that Rolando McClain would miss the first 10 games of the year due to another failed drug test and that newly drafted Jaylon Smith would not be seeing action his rookie season after suffering a serious knee injury during his last collegiate game. They also kept two fullbacks and neither was an actual fullback. Keith Smith (who won the job) was a converted linebacker and Rod Smith was/is a running back. In 2015 and 2014, they kept extra defensive ends as these were the years they were scrambling to replace DeMarcus Ware. From bargain bin free agents (George Selvie and Jeremy Mincey) to controversial draft resources (Randy Gregory) and free agents (Greg Hardy) they were looking for answers so they decided to throw everything but the kitchen sink at the position. This year, the Cowboys are thin at safety and may need to throw extra resources at that position until they can sort things out. Not only that, but with the recent news of Travis Frederick likely missing games, the team could be forced to hang on to an extra offensive linemen. And even though we might have our 53 guys mapped out with still enough space for Lenoir, there stands a great chance that at least a couple more players from the outside will be joining the squad before it’s all said and done so they’ll need to make room for them. Lenoir’s had had a great camp. The youngster has worked incredibly hard to improve his game and he certainly deserves a spot on the roster, but as Clint Eastwood said in Unforgiven, “Deserves got nothing to do with it.” The Cowboys just don’t have the extra space to use on a guy who’s not likely to see very much action.